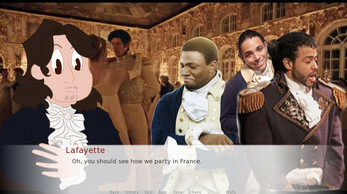 In this game, you play as Alexander Hamilton. 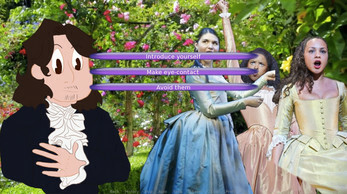 You will help him navigate throughout the many social circles of the late 1700s. Throughout this journey, there will be many familiar faces like the Schuyler sisters, Aaron Burr, John Laurens, and many more. When you reach the end, it will give an error message. My sister will love this once she see it! I will play this if i have a time to spare! heyyy I saw this project on YouTube and it made me so happy my little sisters got to it first so I donated a dollar for all our appreciation only $3 but I hope it helps. Another thing the one you have for android doesn't work it opens and then closes so the game never starts. To be honest with you, I had no plans of ever working on this again, but if you really would like to make the art, then I can start working on it again. Make sure this is really what you want to do. If you don't have much free time, are you sure you can dedicate it to this? If you're fine with all of that, send me an email. It might be a good idea to include some examples of your art too. My email is, thesmileface@outlook.com you could also just link me to a DeviantArt page or something similar. Hi, Planettary ` v `!! Just wondering if you were going to implement multiple endings like Good, Neutral, Bad, etc. I am! At least I think I will, for the neutral ending, do you mean not choosing anyone in the game, or choosing someone but not getting enough points for the good ending? Or neither? For neutral I was thinking it'd be just not getting enough points to get a good ending, or a score not low enough to get some sort of bad ending (if that's being included). Yes, that will most likely be included. Or at least, I would like it to be included. I guess we'll know when I finish. 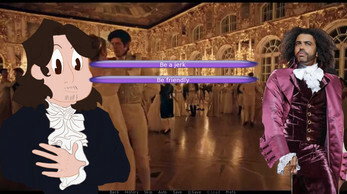 It is unlikely that I will add a route for George, simply because of how much of the plot I've decided on right now. But I can say with confidence that he will appear, but as more of a father figure and not romantic interest. He will probably be very important if you choose the 'Hamilton' route, where you try to advance his career as much as possible. Cool! My Skype is pllanettary, and that sounds so cool! This is so exciting! While I made a video on this game, I'm not sure if you saw it so I'll just leave my feedback here. As a suggestion, I would recommend commissioning artists for the sprites and maybe even CGs. There are a ton of talented artists in the Hamilton fandom and I feel like having original art would attract more people to your project. There are a few spelling mistakes here and there that I found. As you've noted in your post, you'll be working on both eliminating them and writing better dialogue. 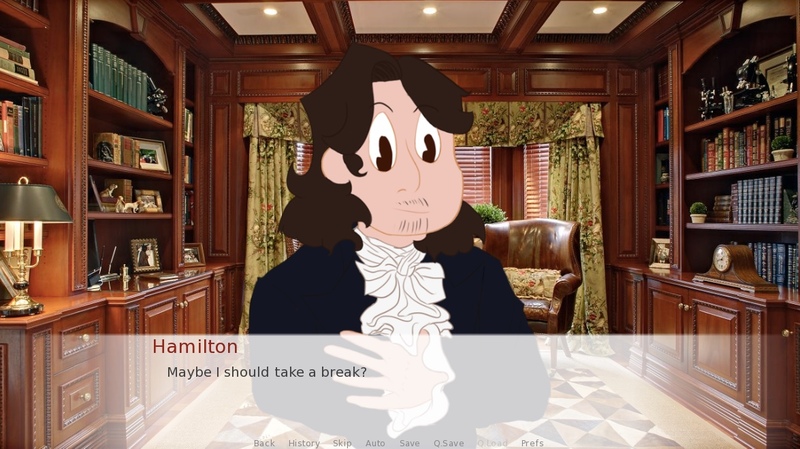 I honestly thought this was a Player x Whatever character from Hamilton kind of dating sim, so I was a tad sad when I found out I'm playing as Hamilton. I mean, I'm not against that but I'm also not against a totally not serious dating sim where you build relationships with historical figures! As it stands right now, this is a pretty alright 'not serious' dating sim for Hamilton. I'll be on the lookout for those updates!